What comes to mind when you think of Sydney, Australia? I’m guessing you’ll be thinking Harbour Bridge and Opera House? What else should be added to the best places to visit in Sydney Australia? I’m going to give you a bit of a tour. Having lived in one of the northern suburbs of Sydney for a while, I’ve spent a lot of time in the area and I’ve walked through Sydney and surroundings quite a bit – using a book called Walking Sydney, which unfortunately seems to be out of print – and discovered quite a lot of hidden gems, which I’ll be sharing with you, alongside the more common tourist spots. 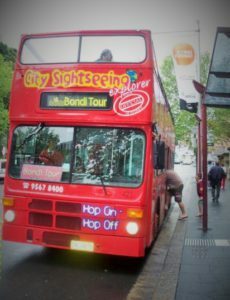 The best way to see Sydney, when you don’t have much time in particular, would be by getting on one of the hop-on/ hop-off buses that are going through the city, constantly stopping at important landmarks and giving you a good first impression of what is there to see. If you only have a day or two to see the sights, this is the best way to do it. You can choose between just the city or Bondi Tour or you can combine the two in one ticket. There are also options for including entry to some of the highlights. Give yourself a whole day to do this (at least), as you might want to go for a bit of a wander in between. For a better and more relaxed experience, choose the 2-day tour. It saves you a bit of money too. There are also options to do a cruise or combine the cruise and the bus. I only ever did the bus tour and then chose to walk around a lot, as well as catch a ferry or boat to other selected places. But it’s totally up to you and how much time you have and how much you want to walk around and see and do. It’s also a perfect option if you’re not that good with walking a lot. Just hop off at landmarks you’re most interested in, stop at the Hardrock Cafe for lunch and continue the tour either sitting downstairs or on the open deck upstairs. You’ll have time to snap some photos as well and depending on how busy it is, you can connect to fellow travellers too. Very enjoyable! I do the hop on/hop off tour every time I come and visit the city again, as I can reminisce in a laid back manner. If you take the hop-on/hop-off bus option, one of the stops will be at the Opera House. You will most likely be walking down towards a roundabout and the Opera House will be straight ahead of you. Such an impressive sight! Take your time to walk around and have a proper look at this famous building. 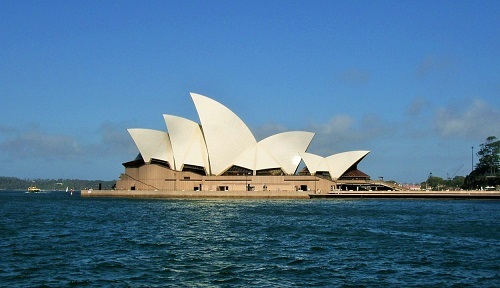 Designed by Danish architect Jorn Utzon, it houses the Sydney Opera, Theatre and Symphony. If you are interested in seeing a show, this would be the place to go. If you’re interested in a tour to find out more about the Opera House itself, you can also book one here as well as find out about the shows currently playing. From the Opera House you get a very good photo opportunity for the Harbour Bridge too. Many millions of photos will have been taken looking from the Opera House towards the bridge. What many people might not take their time to do though, is walk through the Circular Quay area. 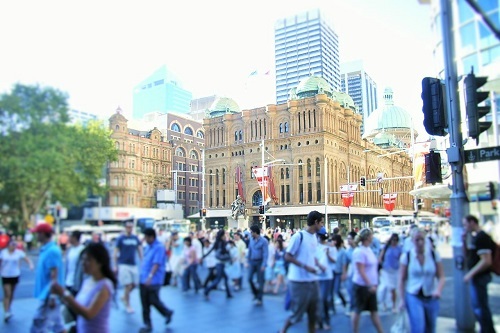 If you happen to be one of the fewer ones to walk the city and enter the harbour area from the main road, take your time to walk past all of the hustle and bustle of the ferries and passengers coming and going on their way to or from work or, like yourself, getting to know the city of Sydney. You might also come upon quite a few street artists, or buskers. Some of them might be making music, others will be street performers and you might end up being one of the ‘volunteers’ to take part in the performance. I was once too slow to get away (I really don’t enjoy being in the limelight, but did it anyway as I was with out and about with the kids I was being a nanny for at the time). It is good fun; at least for the other people watching you. No really, those performers are pretty good. So do yourself a favour and walk past Circular Quay. 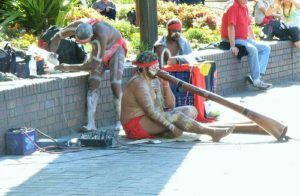 You might be able to pick up a CD of an up-and-coming artist too, or get the original aboriginal music to take home with you and reminisce about the time in Australia when listening to your original music. 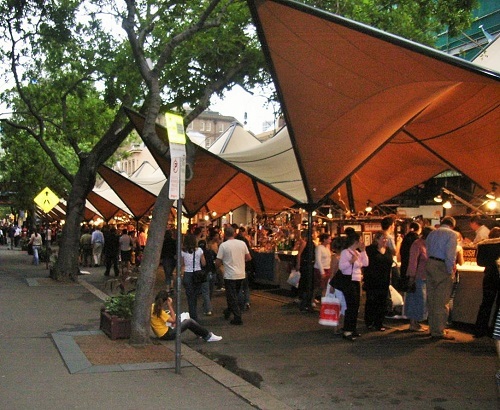 Circular Quay also hosts quite a variety of restaurants and dining experiences. Make sure to come back for a night out. Or breakfast. Or lunch. Just any time of the day really. From Circular Quay you are able to take one of the ferries or water taxis to get to other parts of Sydney, for example, take a short trip to Luna Park, the smallish but delightful amusement park on the other end of the bridge, or take a day trip to Taronga Zoo or Manly. By the way, if you’re planning to be in Sydney for New Year’s Eve, make sure you book early, as it is very popular and will get very busy. Once you’ve got your accommodation sorted, think about where you want to spend the evening. A nice spot is right at the Opera House, where you get one of the best views of the fireworks. I’ve done it and I can tell you, the atmosphere is just amazing. So many people everywhere, but everyone is calm and relaxed and friendly. If you get a chance to do this, go for it. People slowly gathering around the Opera House for NYE. Make sure you get there very early to secure a spot, as it will get very busy. You’ll be celebrating with around one million other people. There’ll be music and dining options too. And the show at midnight is well worth waiting for – even if it is quite a few hours of waiting in the heat. Take sunscreen and possibly a hat and make sure you hydrate. In front of the old entrance to Taronga Zoo. How to get there? As I just mentioned, a ferry will get you there fairly quickly (15 minutes from Circular Quay). Make sure you leave enough time to enjoy the whole of the Zoo and to get back by ferry. Or you could even decide to stay the night Safari-style at the zoo. There are many things to be seen in this gorgeous old Zoo (first opened in 1916), with many shows to enjoy. I highly recommend the bird show though. It was just gorgeous and you get an awesome view over the bay with the Opera House and the Harbour Bridge as backdrop. 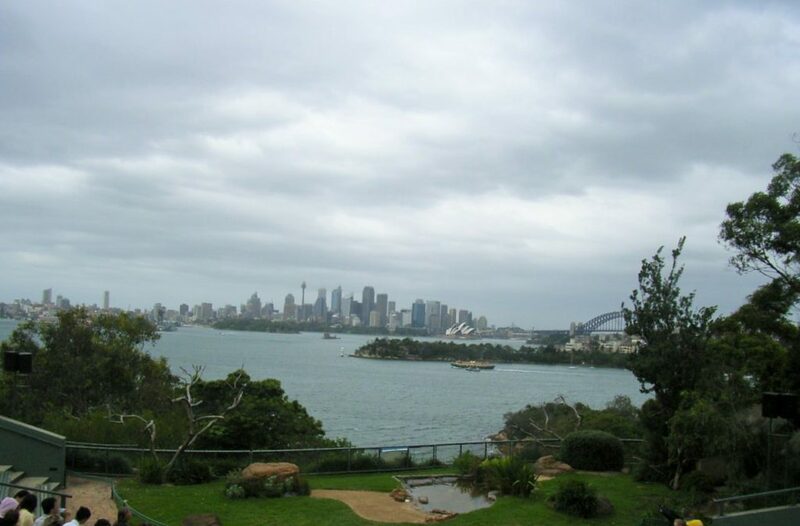 View from the Taronga Zoo bird show towards the city. Even on a cloudy day it is quite impressive. At Taronga Zoo, you can visit over 4000 animals of 350 species. The zoo is open every day of the year from 9.30am to 5pm. Another day trip definitely worth your time is Manly. Manly has gorgeous beaches, shopping, food and is a great spot for a night out. Manly was one of the first places I went to after coming to Australia. Maybe that is the reason I love it so much, but maybe it’s just because it’s a very beautiful place and there’s always something to do. You can spend the whole day just lazing around the beach, going for a casual swim, or go shopping, enjoy breakfast, lunch or dinner or going out at night, as there are so many options to choose from, or you can go for walks, from casual to hiking. I’ve done it all and let me tell you it’s all worth doing. If you get back from Manly after dark, you also get to enjoy the lights of the city and the sight of the Harbour Bridge and Opera House at night. 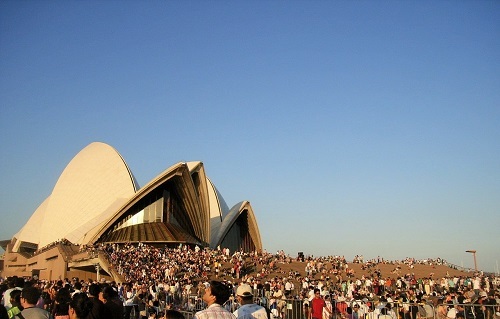 It also gives you a great opportunity to see the Opera House from every angle and take lots and lots of lovely photos. 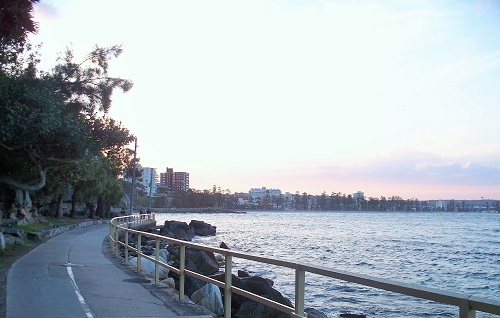 If you love walking, take a stroll along Manly Beach and towards Shelly Beach. It is a beautiful path boarding the water, which will take you past the rock swimming pool, many expensive ocean front properties built on the cliff and even a cafe/restaurant/kiosk. The whole experience is just gorgeous. It is an easy, mostly level walk and because it’s so beautiful it’s very popular and can get quite busy at times. For a break and refreshment, there’s the Boathouse at Shelly Beach, which is also really popular. Here you can just get your caffeine refill or have a delicious lunch or just a snack. It is all catered for. If you’re looking for a special place to get married, this could be it. If you want to continue on, there’s a walk that leads you up to a parking lot and to a cliff face, which will give you a great view over the endless ocean. There’s also a daily 1.5km return swim from Manly to Shelly Beach, which you can join early in the morning. And if you like really long walks, you can continue on from the car park above Shelly Beach and walk towards the Sydney Harbour National Park. This will take you past St Patrick’s Estate, where Nicole Kidman and Keith Urban got married at the Cardinal Cerretti Memorial Chapel in 2006. 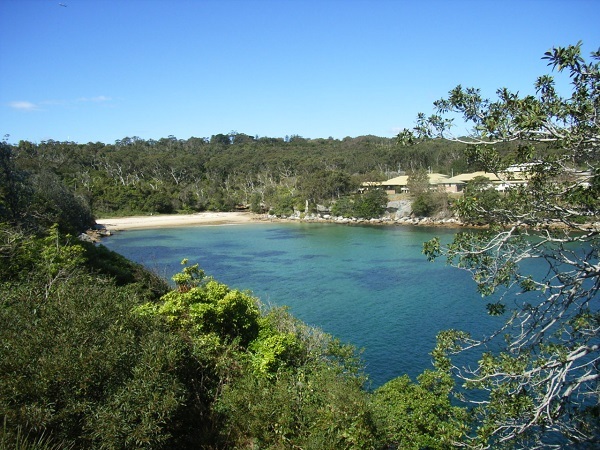 It will also take you past one of the historical sites, the North Head Quarantine Station. It is a heritage listed building, which used to be a quarantine station, but is now home to a hotel and restaurant, as well as a conference centre. Make sure to wear proper walking shoes and a hat and bring water and sunscreen. Back to the Opera House and surroundings, you will find the gorgeous Botanical Gardens. You can walk here for hours and will be able to take many more photos of flowers and plants and bird life. There are free daily guided tours and lots of other workshops and talks on all the time. You’ll get all the information on their website. It is a great place for walking, having a picnic, doing sports or even having a wedding. It is also a good spot to view and take part in the New Year’s Eve festivities. Government House is also part of the Botanical Gardens. 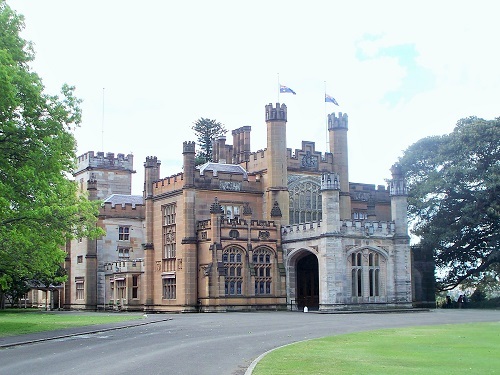 You can visit the Government House during certain times through a guided tour, unless there are functions or other reasons for it to not be open to the public, such as visits from celebrities, as just happened in October 2018 with Prince Harry and Meghan Markle visiting as part of their visit to Australia. Again, for the walkers; do yourself a favour and walk across the bridge. It is pretty impressive to see the monstrous design of the sixth-longest-spanning arch bridge in the world. 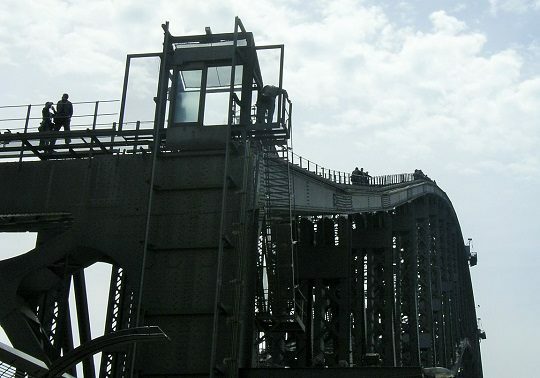 It is also the tallest steel arch bridge, with a whopping 134m or 440 ft from top to water level. When you’re roughly half way on the bridge, turn around and take in the beautiful view of the harbour and Opera House and again, take plenty of photos. If you want to walk the whole of the bridge it will roughly take you half an hour one way. Make sure to take some water with you along the way. And a hat and sunscreen. Even on cloudy and overcast days you can get sunburn. On the other side of the bridge there are some nice parklands for a leisurely stroll or to have a picnic at, or, as mentioned earlier, you could visit Luna Park for rides, food and drink and other entertainment. Another highlight for many is the Harbour Bridge climb. It is a bit pricier, but well worth it. If you are afraid of heights, you might want to leave this one out though, as it is quite high. For others it will be an exciting experience which will make for great memories. Getting ready to do the Bridge Climb – a bit scary! There are certain conditions and restrictions that will take effect, so read through the information before you book the experience. The Rocks are Sydney’s oldest part of the city; this is where the first Europeans settled in 1788. Since its early beginnings of mainly housing convicts and prostitutes, it has seen a big change and is now a very popular area for tourists, with plenty of charming little shops, restaurants and pubs and a bustling nightlife. Markets are held every Saturday and Sunday and every Friday there’s a Foodie Market on as well. Here you can find lots of artsy and crafty things alongside the beautiful shops and cafes. 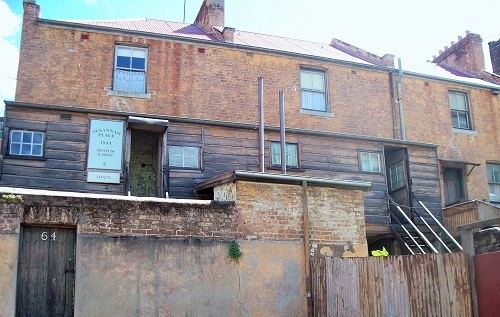 If you’re interested in the history of The Rocks, take a walk to Cadman’s Cottage or Susannah Place Museum and get a glimpse of what it was like to live in the oldest part of Sydney in the early 1900s. At Susannah Place Museum you get a good idea of what it was like for working class families during those times, sharing small living areas with large families, using outdoor bathrooms and only having tiny backyards to dry their washing and offer a place to play for the children. There are just so many things to see and do at The Rocks, such as visiting the oldest pub or – seeing as I am German and when you’re overseas you kind of get drawn to things that are familiar – the Munich Brauhaus, formerly known as the Lowenbrau Keller. Great food, great drinks, great atmosphere. If you don’t love this part of Sydney, there’s nothing more I can do for you. 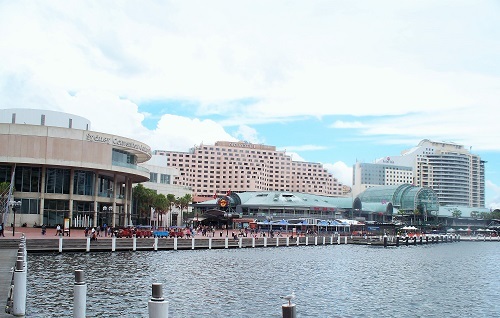 In case you ever wondered, Darling Harbour is named after Lieutenant-General Ralph Darling, who also named several other places around the area after himself, such as Darlinghurst, Darling River and Darling Downs to name a few. He was the governor of New South Wales from 1825 to 1831 and isn’t described as the nicest person to say it in the nicest way possible, but he is also known for building roads and extending the boundaries of the colony. Anyway, there are sooo many things to do and see at Darling Harbour, that it’s hard to know where to start. One of my favourites is simply hanging out harbour side and enjoying people-watching while drinking coffee or eating ice-cream. 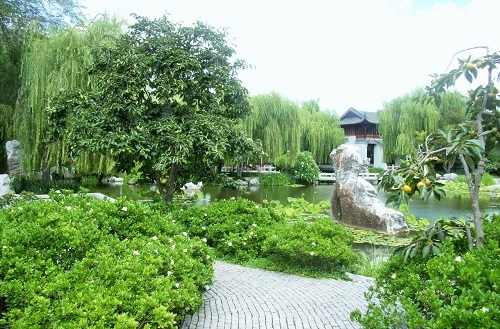 Day time favourites are visiting the Chinese Garden of Friendship, which is a beautifully landscaped garden in which you can spend many hours walking, relaxing and again, being a tourist and taking a plentitude of photos. You can also get dressed up in traditional Chinese clothes for a small fee. If you want to try your luck, plan a visit to the casino – The Star. There you will find, apart from the casino, entertainment, dining and accommodation, as well as a spa, all in one place. As mentioned before, there are quite a few museums to visit in Sydney, such as the Australian National Maritime Museum, where you can climb aboard a submarine and visit a tall ship apart from many other interesting exhibits to discover. Once when I visited there was a boat there made completely out of beer cans. What else is there to see and do at Darling Harbour? Madame Tussauds Sydney – share a photo with Ned Kelly or Steve Irwin, two of Australia’s icons. Starship Sydney is the largest and most contemporary glass boat in the world. For even more options, have a look at Things to do at Darling Harbour. George Street connects the city centre and central train station with the harbour. Enjoy a wonder along a busy road with loads of options for shopping, restaurants, pubs/hotels along the way. The Queen Victoria Building (short QBD) awaits with a lots of shopping opportunities for every purse and underneath there is a food court and a train station to take you to your next stop of interest. The hop on/hop off busses stop here as well. Something that can happen to you when you’re walking on George Street: You walk by a cinema where there is a red carpet and lots of people waiting for something or someone and you think to yourself ‘maybe i’ll stick around for a moment’, just to be rewarded with Hugh Jackman pulling up literally right next to you in an R8, lowering his window and saying ‘Hi’ to the crowd. Of course you’re completely star struck immediately and just stare at him in awe and admiration and forget to respond at all. 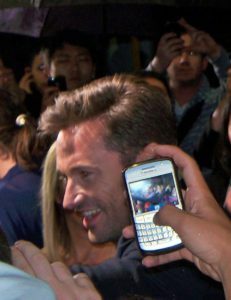 I’m guessing Hugh must’ve thought what a weird person I was, probably waiting for hours just to see him and then not even show excitement upon seeing him. Little did he know we didn’t have a clue what was about to happen or we would’ve acted accordingly. At least I was able to take a (wobbly) photo as proof. Sorry for the dodgy photo, Im not used to being a Paparazzi and I have no idea whose Blackberry that is either. He was there for the premiere of the 2011 movie Real Steel, which I have yet to watch I have to add. Well, there you go. Go walk along George Street and be rewarded. Paddington is a pretty neighbourhood with lots to see and do. If you just happen to walk around the area, as I did with my walking book, you’ll see beautifully restored Victorian style buildings and lively areas with pubs and cafes. There are markets held every Saturday and offer crafty items and clothing made by local artists. If you love gardens, do yourself a favour and visit Paddington Reservoir Gardens, which is a heritage listed public park. Also in Paddington you will find contemporary art galleries, the Victorian Barracks Museum and at night time hip bistros and gay bars will draw you in. The famous beach can be reached by one of the hop-on/hop-off buses or public buses. 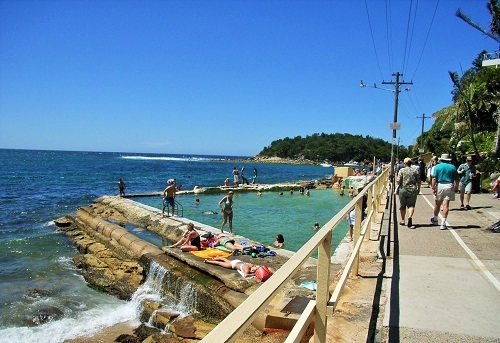 It is a nice spot, but certainly not the best beach of Sydney in my opinion, and I’ve visited quite a few. Would you believe it that Sydney apparently sports a whopping 142 beaches? There is definitely a spot for everyone, depending on what your preferences are, from surfing to swimming to having a quiet, lazy afternoon without too many people around. From Bondi Beach you can do a coastal walk to several other beaches, over cliffs and through a beautifully maintained, very old graveyard overlooking the ocean. 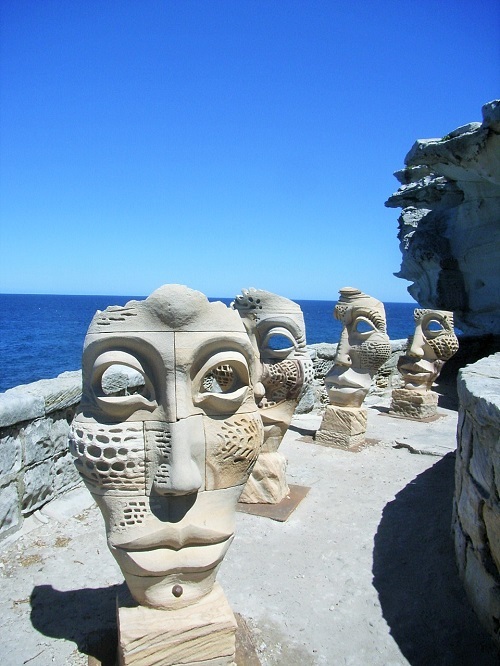 If you are there in the right month, go for a walk all the way to Tamarama Beach (which is gorgeous by the way) and find yourself surrounded by art. That is if you’re lucky enough to be there when the Sculpture by the Sea event is happening at the end of October to early November. This is all for free. Australia’s oldest public park, the heritage listed 16.2 hectare Hyde Park is located right in the centre of Sydney’s business district and is divided by Park Street. The southern area contains the ANZAC Memorial Building and visitor centre, numerous monuments, statues as well as the pool of reflection. The northern part hosts various themed gardens such as Sandringham and Nagoya Gardens including their public art works, monuments and water features and also features the iconic Archibald Fountain. 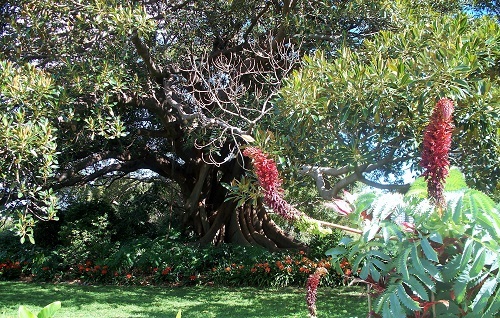 The garden is home to more than 580 mature exotic and native trees and features the historic central avenue of Hill’s Figs, lining the central pedestrian avenue all the way from Macquarie Street to the ANZAC Memorial. Be sure to visit this popular attraction. For more information on Hyde Park and to find out more about Sydney’s other parks and basically everything Sydney, have a look at this website. 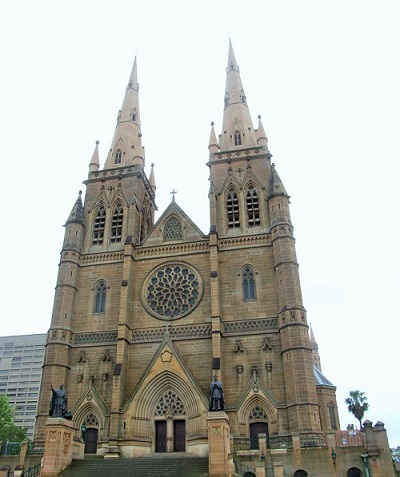 St Mary’s Cathedral is Australia’s largest Cathedral building and regarded as the Mother Church for Australian Catholics. Located on the corner of College Street and St Mary’s Road in central Sydney, it is a convenient stroll just across the road from Hyde Park. It took close to 100 years to finally complete the English style Gothic revival made of honey coloured Sydney sandstone with two main building stages; the first between 1866 and 1900 and the second between 1912 and 1928. Remember that this is a place of worship and act accordingly. For more information on tours and what you will experience, check out the website. It is well worth a visit if you like exploring churches or like history and architecture. You don’t have to be catholic or religious or spiritual to appreciate a visit here. Two more places I want to mention in the context of Hyde Park and St Mary’s are the Australian Museum and Hyde Park Barracks. The oldest museum of Australia, The Australian Museum is internationally renowned for its natural history and anthropology. You can easily spend a whole day exploring all the different areas, such as dinosaurs and precious gemstones as well as cultural treasures. And not to forget, there’s a restaurant with a view of St Mary’s, Hyde Park and Sydney’s Skyline! A UNESCO World Heritage site, the Hyde Park Barracks is located on Queen’s Square, right in the historic heart of Sydney, just a short walk from Hyde Park. It was first built to house male convicts, but later sheltered immigrant girls and young women as well as cared for older, sick and poor women. More than 100000 people passed through the barracks and left behind a little of their lives, discarded items or personal possessions, which are now on display. Not only is the Barracks a place of convict history, but also of free immigrants and asylum seekers as well as the story of Aboriginal communities who resisted the rapid expansion of the colony; short, it’s the story of Australia’s modern beginnings – a story or many stories that will leave a lasting impression on you. Please note that Hyde Park Barracks are currently closed for major renewal and will re-open in late 2019. On their website you can find many other houses and museums which will give you a great idea of what it was like in the early beginnings of the colony (such as Susannah Place Museum, which I mentioned at the beginning of this post). 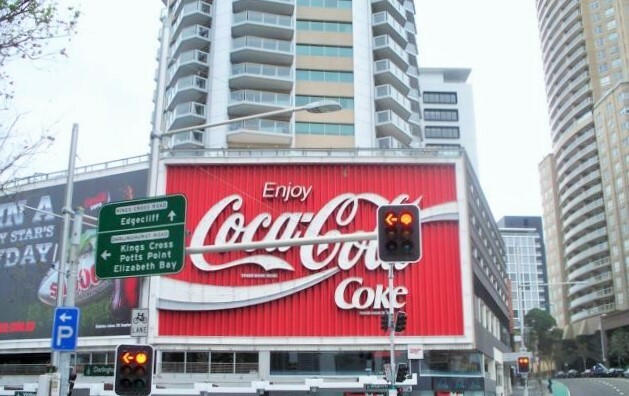 Kings Cross or “The Cross” is known to be Australia’s red light and drug capital and many people want to have a look at what this means. Walking around during the day I have not found anything that could be said to be dangerous, but that doesn’t mean you should stare at people or make snide remarks, as this might end you in trouble. Take caution and maybe walk around with a few people, especially at night, as this is the main time where the sleazy awaken and wander around. Alongside the expected strip clubs and adult shops and nightclubs you will also find some trendy cafes pop up and it will be an experience. Just be a bit careful. We were once walking around with just the two girls of us and wanted to go into a nightclub which was apparently not for us and so we were told, rather nicely, by the bouncers who were guarding it. Personally I have not had any bad experiences at Kings Cross, but others have reported it to be dangerous, especially at night. If you want to stay around the area, choose Darlinghurst or Potts Point, which are close by, but will see you much safer. If you have a bit more time on your hands and want to experience something truly spectacular, book yourself a bus tour to the Blue Mountains. These are roughly an hour away from Sydney and absolutely worth traveling there. The Blue Mountains are called that as they are mainly eucalyptus trees and give off a kind of fog that looks blueish in colour. As you may or may not know, eucalyptus trees are the main food for koalas, so there’s a good chance you might see a koala in the wild too. 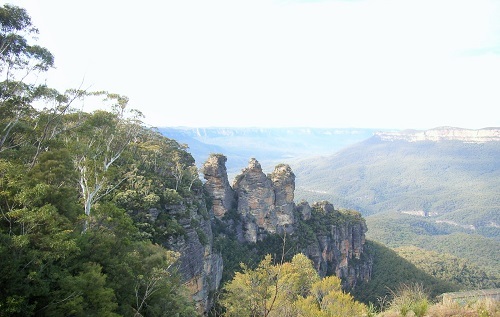 At the Blue Mountains you will also see the Three Sisters, a rock formation consisting of 3 rocks. You can walk either up to the lookout, down the steep stairs (and back up) to the three sisters, use a cable car to fly over the mountains, or walk the whole area (there are different options from short and easy walks to challenging walks which will take a long time and you have to be an experienced hiker). 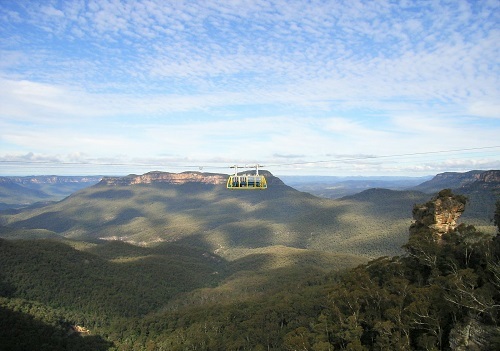 You can join tours for walks and to discover more of the Blue Mountains. If you go in winter time, as I did, make sure to wear something warm, as it can get quite chilly there. I hope you are getting a good idea of what you can expect of visiting Sydney and will take some beautiful memories away with you. I certainly enjoyed my time living there and enjoy each and every time I come for a visit. I have thousands of photos to show for it and many wonderful memories. Let me know if you have any questions or comments or think there’s information missing or would like to share some of your own experiences too. I’ll be sure to get back to you soon. If you are in need for luggage for your travels, no matter where, have a look at my reviews, which I’m always updating to find the best options for you. Thanks for the great post. 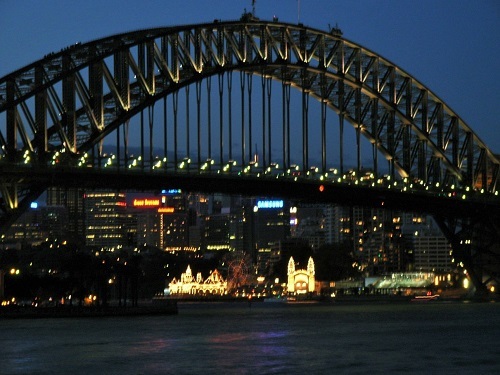 Australia and especially Sydney is, and has always been, on my must visit list. I’m particularly interested in visiting the Zoo, the Botanical Gardens, the Manly beach and the Blue Mountains. I actually have 3 hobbies that go well with travel. Is there anything you can tell me about SCUBA diving, sailing and drone rules for the area? Here’s where I reveal my poor geography knowledge… I really want to dive the Great Barrier Reef. Where is that in relation to Sydney? Reading this post has got me excited to do a little traveling again! Sailing is possible in so many different locations, you won’t have a problem finding options, where ever you go on the Australian coast. Scuba diving is similar, there are offers along the coastline pretty much everywhere. You can discover ship wrecks or dive with sharks, other areas offer diving with shark whales and so on. The Great Barrier Reef covers quite a large area (more than 2,000 km) on the east coast, up in Queensland. Sydney is in New South Wales, on the south eastern part of Australia, whereas the Reef is in the north eastern part of the country. Nice piece about Sydney, Australia. Really its a place I still hope to visit soon. Having seen all the beautiful places that look appealing to me. One of the places is Circular Quay. I love the music and the performance meeting and getting to know other cultures. How is the weather? When is the best time to visit? Thank you. It’s a city that offers something for everyone. It’s summer time at the moment and can get quite hot and/or rain a lot, as it is also wet season. If you’re just visiting Sydney, it’s not really so dependent on the weather, but if you want to see other parts of the country as well, I’d recommend coming over in September/October. That’s spring in Australia and temperatures are perfect for travel then. I have never been to Australia but one day hope to. I keep getting drawn to google Sydney and surroundings especially. 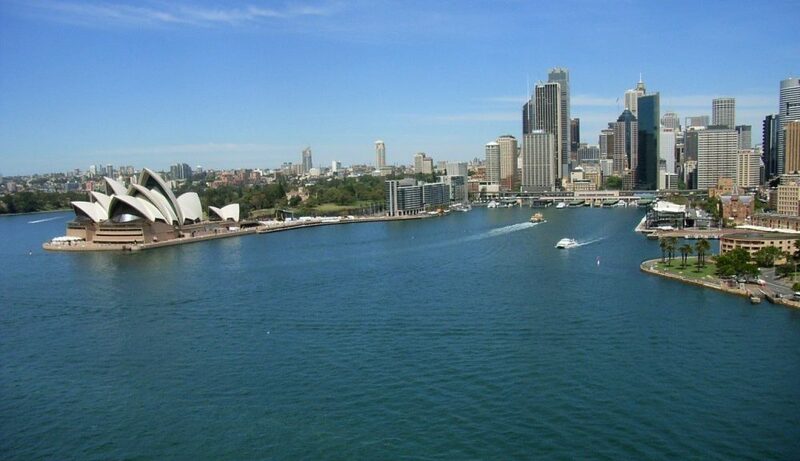 I have heard a lot about Australia and Sydney and how beautiful it is. I think Sydney is the most populous city in Australia and it does seem like it has a lot of nice locations for tourists to visit. I did hear that Australia has a lot of reptiles. Is this also true in Sydney or is it an exception to this? Sydney is absolutely lovely. There are roughly 5 million people living there. Australia has lots of dangerous animals, but the cities are usually safe. Reptiles such as crocodiles are found up north in the country, but not in Sydney, unless you go to the zoo. In the parks you can find spiders and snakes and spiders will also be around houses, even in the city. Snakes can be found there too, but not as commonly. You just have to take some precautions, such as wearing thick gardening gloves when you do work in the garden, but you don’t have to scared of being chased by a crocodile in Sydney. I have not been to Sydney before but I have heard a lot of good things about the famous city. I plan to visit the beautiful city this year and have been doing some research. That is how I found your lovely article! The Botanical garden will be topping the list of the places that I will most likely visit. I have heard about the garden and I want to have a first experience of the place. Thanks for the detailed article. I’m looking forward to see Sydney for myself now. You are most welcome. The gardens are definitely worth a visit. You can spend hours there and discover new things all the time. I’d love to visit Australia as a tourist from the Philippines. I have visited other neighboring countries here like Hongkong and Malaysia with tourist packages sold here in my country by travel agencies, and I’d like to visit Australia too. My friends and relatives have traveled there months and years ago and they were posting on Facebook how great the place is, so by reading this article, I got reminded how exciting it is to be there too. I browsed the list but unfortunately, there’s one that I like to visit but I can’t find in the above list. I forgot the name of the place in Australia, a friend just showed the picture to me, it was like a desert with orange or bronze colored landscapes similar to the Grand Canyon of Arizona. Big rocks with stain colors. Are you familiar with the place as I want to include it in my itinerary? Yes, Australia is a great place to be and rather big too. That’s why you couldn’t find Uluru (also known as Ayers Rock) on the Sydney list. Sydney is in New South Wales, on the southeast coast of Australia and Uluru is pretty much right in the center of Australia. Uluru by the way is known as the world’s largest monolith, meaning single rock, but it’s not quite the truth. It’s part of large rock formations which are mostly underground, stretching as wide as 100km. But of course we can’t see this. What we do see is still a very impressive sight and definitely worth a visit. If you come for a visit, please be mindful that it is a sacred place for the aboriginal people of Australia.